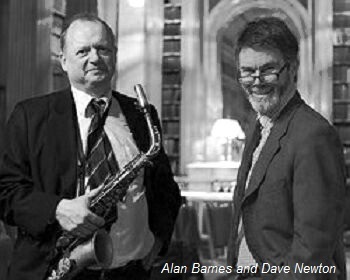 Pianist David Newton is well known on the club circuit, usually leading the rhythm section accompanying a named horn player but he is an accomplished leader in his own right with a string of superb trio CDs to his name, often with Andrew Cleyndert. A number of his lesser known earlier albums from the 1990s are now being re-issued as interest in this talented artist grows. Alan Barnes (cl,as,ts) David Newton (p), Paul Morgan (b), Mark Taylor (d). Fried Bananas/Affiliation/You Go To My Head/Alice B/Easy Does It/You Don't Know What Love Is/Pickles/Top Flat/Straight Life. David Newton (p), Dave Green (b), Allan Ganley (d). David Newton (p), Alec Dankworth (b), Clark Tracey (d). Wishful Thinking/The Night We Called It A Day/It Never Entered My Mind (dn p-solo)/Victim Of Circumstance/One And Only/ Please Come Home/The Way You Look Tonight. Ol' Blue Eyes/Bedroom Eyes/Angel Eyes/Soul Eyes/Stars In My Eyes/Eye Of The Hurricane/My Mother's Eyes/Eye Witness. combined personnel: Martin Shaw (tp), Alan Barnes (cl,as,bs), Andy Panayi (f,ts,bs), Iain Dixon (ts), David Newton (p), Paul Morgan (b), Mark Taylor (d). Stars Fell On Alabama/Autumn In New York/Stay As Sweet As You Are/Groovy Samba/Go Home/Solitude/Ecaroh/Sweet And Lovely/Double Take And Fade Away/Thirsty Work. Martin Shaw (tp), Alan Barnes (cl,as,bs), Andy Panayi, Iain Dixon (ts), David Newton (p), Paul Morgan (b), Mark Taylor (d). Let's Face The Music And Dance/Mood Indigo/B/O Grande Amour/One From Bruce/Chelsea Bridge/Better Late Than Never/Donna Lee/How Long Has This Been Going On/Ladybird/Below Zero/Raincheck. David Newton (p,keyb), Dave Green (b), Allan Ganley (d). Get Lost/Blessed Land/Teach Me Tonight/June Time/My Romance/There's A Small Hotel/Sugar Cake/A Remark You Made/Older And Wiser/When Will I See You? Alan Barnes (bs), David Newton (p), Matt Miles (b), Steve Brown (d). Woodville/Song For Strayhorn/Below Zero/Estate/College Groove/A Flower Is A Lovesome Thing/K-4 Pacific/A Lady's Vanity/Waltz For Debbie/Blessed Land/Mambo Koyoma. Conte Candoli (tp-1), Alan Barnes (as,bs), David Newton (p), Matt Miles (b), Steve Brown (d). Crafty(1)/Two Degrees East Three Degrees West(1)/Manhattan/Jigsaw(1)/Star Crossed Lovers/St. Vitus Dance(1)/The Trip/Landscape(1)/Sun On Stairs(1)/I'll String Along With You/Blues On The Beach. David Newton (p), Colin Oxley (g), Dave Chamberlain (b). David Newton (p), Matt Miles (b), Steve Brown (d). Alan Barnes (as,bs), Scott Hamilton (ts), David Newton (p), Matt Miles (b), Steve Brown (d). Zootcase/Stella By Starlight/Bean Soup/Stardust/I'll Remember April/Do Nothin' Till You Hear From Me/On Green Dolphin Street/My Ideal/Just One Of Those Things/'Disorder On The Border. David Newton (p), Colin Oxley (g), Andy Cleyndert (b).